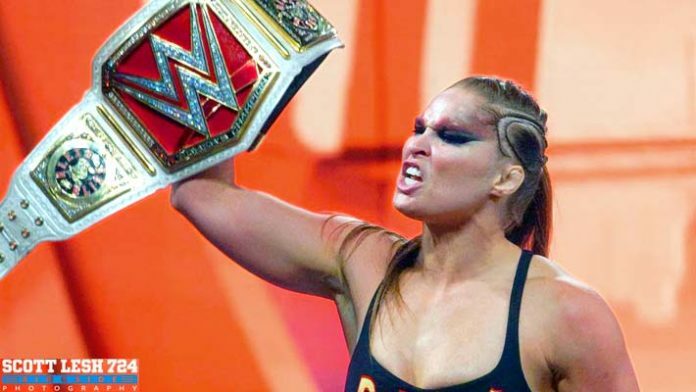 RAW Women’s champion, “Rowdy” Ronda Rousey continues to evolve in her new role within the WWE, as she debuted a new move into her arsenal this past Friday during a live event in Edinburgh, Texas. Ronda has added a gut wrench powerbomb into her moveset, unleashing it during a house show match that saw her retain over former champ-Alexa Bliss, days before their championship rematch at tonight’s Hell In A Cell pay-per-view. Her love of pro wrestling and, in particular, her personal fandom of “Rowdy” Roddy Piper has been well documented, and she has done an impressive job so far in the role that has been given to her. Many were positively surprised after her debut match went down at this year’s Wrestlemania 34, where she teamed with Kurt Angle, defeating Triple H and Stephanie McMahon via submission. It’s reaffirming to see Ronda Rousey endeavour to continuously apply herself as she continues to transition from former Mixed Martial Arts competitor into WWE Superstar. With a love for the product, a natural aptitude, undeniable athleticism, and a willingness to grow and change, Ronda could well be on her way to becoming one of the best in the business.